In the Sierra Club list of “Cool Schools” for 2016, seven of the ten University of California campuses rank in the top thirty for sustainability. Note: UCSF is not ranked, because it has no four-year undergraduate program, just a med school. Because the Sierra Club relies heavily on self reports by the campuses, it is not clear that the numbers are really directly comparable. Different standards will be applied in answering the questions, with some colleges really stretching the definitions in order to appear sustainable, and others having very strict standards in which well above average behavior and facilities are deemed inadequate. Their point system is based on the Sierra Club’s particular beliefs about what is important (giving a lot of points for divestment from fossil fuel companies, compared to the points given for low use of fossil fuels, for example). They also reward reductions in water consumption and energy usage “since an established baseline period”, but there doesn’t appear to be any uniformity in when the baseline was established nor any reward for having always been a low consumer. A water-usage per student and energy-usage per student measure would probably paint a very different picture, with places like UCSC (which have always been sparing in both their energy and water usage) moving way up in the ranking. Of course, energy usage varies a lot with the climate, and coastal California campuses should be able to use a lot less energy than ones in Michigan and Minnesota—but sustainability measures should not start out by giving bonuses for building in places that require unsustainable practices. Some of their standards are a bit strange, giving as many points for a “bike-sharing program” as for “bike storage, shower facilities, and lockers”, and nothing for bike lanes/paths. 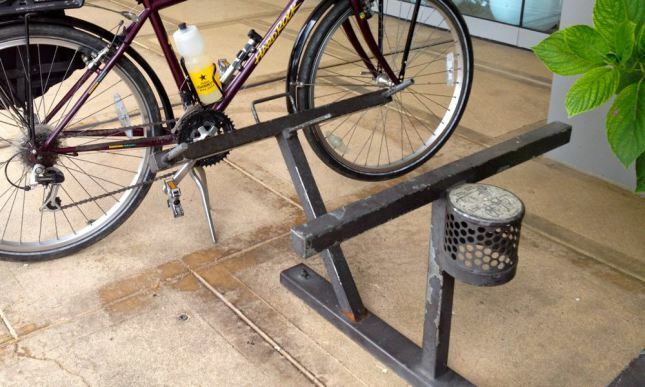 Bike-sharing programs are pretty much PR fluff on a college campus, but bike parking is crucial (though for commuters policies that allow bikes in the office are often better than lockers or bike storage facilities). UCI, UCB, UCSD, and UCSC all do better in their transportation rankings than UCD, but I suspect that UCD actually has the lowest per-student or per-employee transportation impact, because the very much larger share that bike commuting has there. They may be giving more points for public transportation than for bicycling, which would explain Columbia University being at the top of their ranking. Unfortunately, the Sierra Club does not seem to have made the raw data from which they did the scoring available, so it would be difficult to redo the rankings based on different weighting of the criteria, and difficult for student organizations to determine where their campus is missing the mark, in order to push for improvements. There are parking posts like this one all over Montreal, numbering the parking spaces for payment, but only a few of them have the extra ring for locking bicycles to the post. 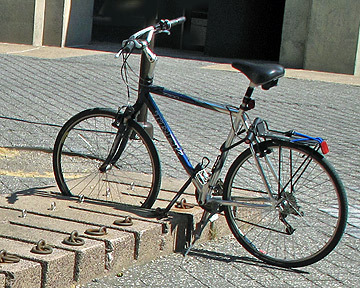 This 8-bike rack was spotted on the McGill college campus, in front of their natural history museum. It makes a nice sculptural statement, and is moderately compact, but looks a little difficult to use with tandems, recumbents, children’s bikes, and others that don’t fit the rather narrow idea of what the dimensions of an adult bike are. Last week I finally had an opportunity to visit UCSB, where my son will be going to college in the Fall. This college visit was a bit different from other ones we did together, as he had already filed his statement of intent to register (in UC jargon, the “SIR”). So we were not deciding whether UCSB was a good place to apply, or whether to accept an admissions offer—this was an orientation session for new freshmen and their parents. Because we don’t drive, and the Santa Barbara airport is very expensive to fly to from anywhere but LA (and somewhat expensive even from LA), we took Amtrak to Santa Barbara. There are multiple ways to get from Santa Cruz to UCSB by train, but we took the simplest and most familiar: Highway 17 express to San Jose ($5), Coast Starlight to Santa Barbara ($51, but the price is higher if you don’t buy the tickets far enough ahead of time), MTD bus 11 to UCSB ($1.75). (Note: the number 11 bus is not as fast as the 24X or 15X express bus, but those don’t run on Sundays, which is when we were going to Santa Barbara. The Coast Starlight is a rather slow train, and there are bus+train combinations that are faster, but both my son and I tend to get motion sick on buses, so we preferred the train. One could take the Greyhound to Santa Barbara for only $37, but that is about 6 hours on the bus. One could also take Greyhound to Salinas ($12), then Amtrak 4740 bus to San Luis Obispo and the Pacific Surfliner to Goleta ($42), and MTD bus 15X (or walk a mile and take the 11 on weekends) to UCSB ($1.75). One could also take the Coast Starlight from Salinas to Santa Barbara ($12+$39+$1.75), reducing the bus time to the same as taking the Highway 17 express, and the bus to Salinas is probably less of a roller-coaster ride than the bus to San Jose. The connections are not tight, so no time is saved by catching the train in Salinas—the extra time is spent waiting at the Amtrak station in Salinas. Because it was a two-day orientation, they put us up (separately) in dorms for the intervening night. Because we were using Amtrak to get to Santa Barbara, we needed an extra night before and after, which we also spent in a (different) dorm, managed as the UCSB Summer Inn. All the dorms were in Manzanita Village, which is the dorm complex my son has requested. The dorms were spacious with lots of closet space, but a bit too warm—a fan would be a useful addition to the fall dorm supplies. The mattresses were also a bit too firm for my taste—my son may want to get a softer foam pad to put on top of the mattress. Bus service for UCSB is not bad on weekdays, but is a bit skimpy on weekends. Even at its best, it is not as frequent as UCSC bus service. Of course, the UCSB campus is more compact than the UCSC campus, and UCSB students mostly live on campus or a short walk away from campus in Isla Vista, so bus service is not as necessary. Also, the UCSB campus and surrounding area is flat, so bicycling is very easy (even with the low-efficiency “beach cruisers” that southern California finds fashionable). 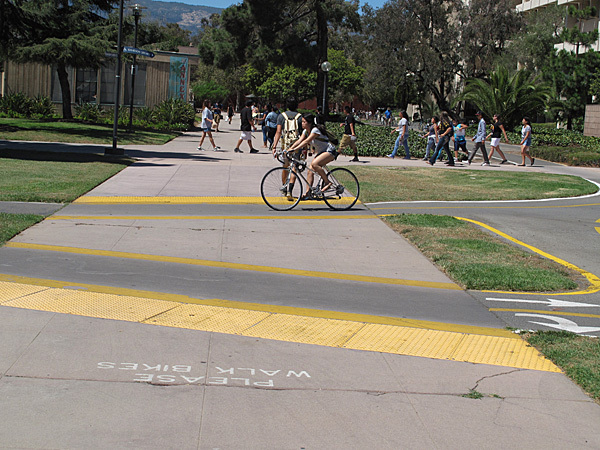 UCSB has bike paths on which bicyclists have priority over pedestrians, and traffic is heavy enough during the school year that they found it useful to put roundabouts at a couple of the major intersections of bike paths. Bikes have the right of way on the paths, and (unlike roads) the pedestrian crosswalks do not give the pedestrians right of way. There are warnings and textured strips to caution the pedestrians. Bicyclists are expected to walk their bikes when on the pedestrian paths (with frequent warnings about heavy fines), but this rule seems to be routinely ignored. 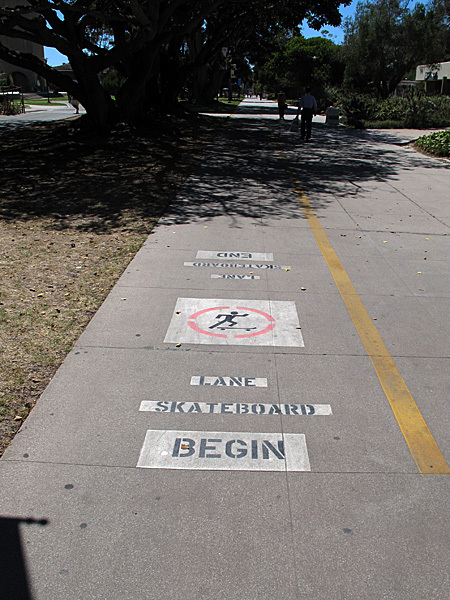 There is even a separate skateboard lane on one of the main campus paths (taking up part of a wide walkway and paralleling a divided bike path). 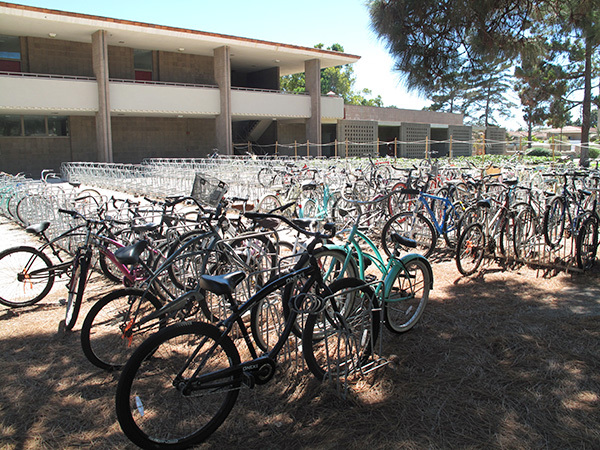 Bike parking is copious, often with seas of bike parking near classroom buildings. 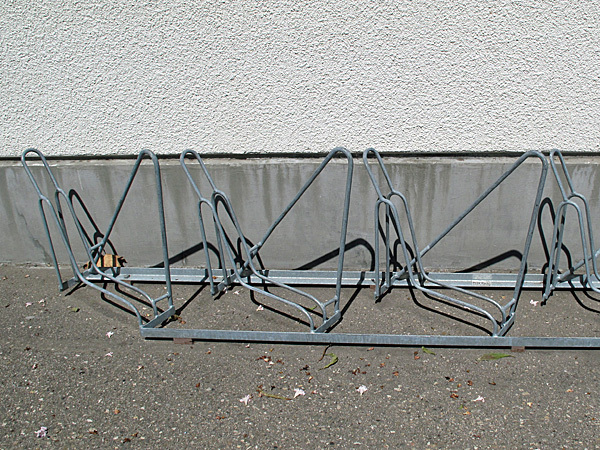 Most of the bike parking is of a style that alternates high and low, intended for allowing tight packing of the bikes without handlebars interfering. There is an adequate locking point for the frame, but not for the rear wheel. 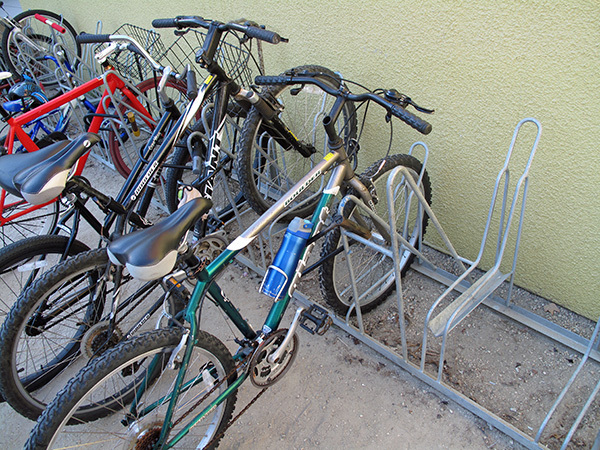 In a couple of places, the “low” version of the bike parking is installed diagonally, where there is not sufficient space for the bikes to be perpendicular. This view shows the locking loop beside the wheel-holder clearly. 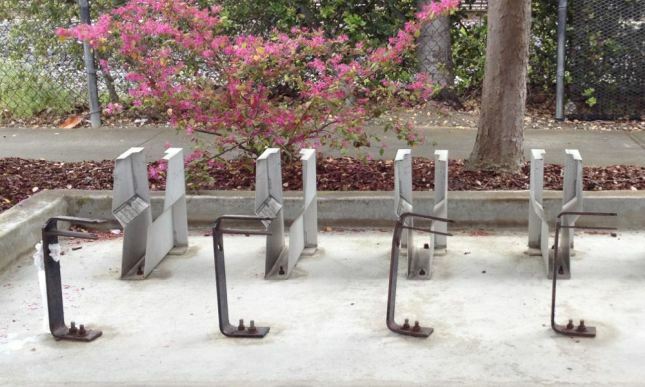 In a few places, UCSB has wheel-bender racks that provide neither support for the bikes nor adequate locking points—these were clearly selected by someone who did not park a bicycle. Although the campus is compact and easy to navigate in, it is not small. A walk from the dorms my son hopes to stay in (Manzanita village) to the College of Engineering (where many of the faculty he might do research with have offices) is about a mile. Given the distances, the flat terrain, and the mild weather, bicycling is probably the best way to get around campus. 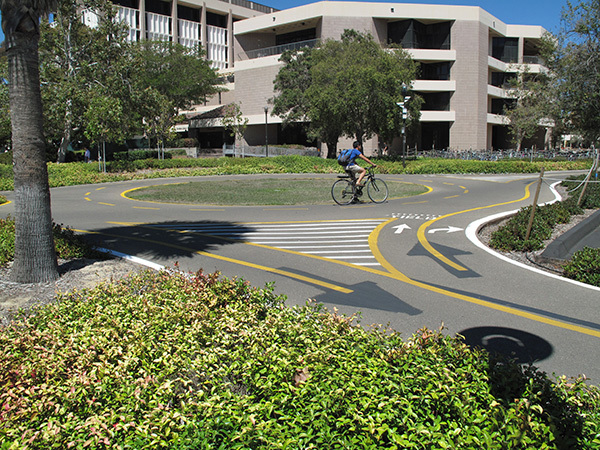 I saw a number of cyclists at UCSB, but very few wearing helmets. We were warned that even experienced bicyclists should probably avoid cycling on campus for the first two weeks of Fall quarter, as there were a lot of bike crashes during that period, often caused by new cyclists who did not know what they were doing. 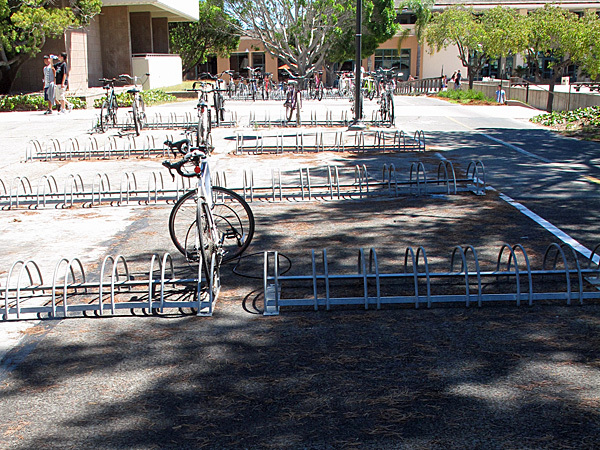 It seems that UCSB’s infrastructure efforts are not matched by bike safety education efforts. 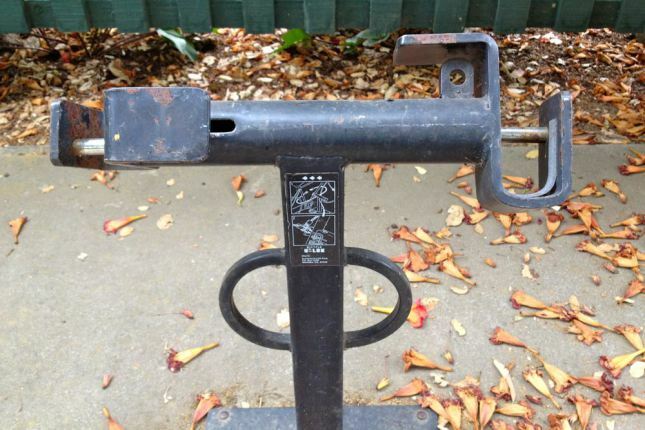 Bike theft is also a major problem on campus—the suggestion is to get an ugly old bike and use a good lock. There is a sale of abandoned bikes during Welcome Week in the fall, and my son will probably get a bike then, rather than lugging his from home. I think that a 3-speed with front and rear brakes is probably the ideal bike for UCSB conditions—easier to maintain than derailleurs, but more efficient than a one-speed beach cruiser. UCSB has a few more students than UCSC (22,225 students in Fall 2013 vs. 17,203 at UCSC), and a higher proportion of grad students (12.9% vs. 8.8% at UCSC). At the orientation, UCSB claimed to have the highest proportion of undergrads of any R1 research university, but they achieved this status only by using a non-standard definition of an R1 university, using the 62 invitation-only members of the Association of American Universities, rather than the 108 “RU/VH: Research Universities (very high research activity)” in the Carnegie Classification of Institutions of Higher Education, which is the more commonly used definition of “R1 university”. UCSC is on that bigger list, and probably does deserve the status of the R1 university with the highest ratio of undergrads, which UCSB was improperly claiming. Although UCSB has only 23.4% more undergrads than UCSC, they have a few much larger class sizes. They have several lecture halls seating 300 or more students (Campbell Hall @ 860, Isla Vista Theater 1 @529, Lotte Lehman Concert Hall @468, Chem 1179 @354, Buchanan 1910 @306). UCSC has 3 classrooms with 300 or more and none over 500 (Classroom Unit 2 @472, Media Theater @382, and Humanities 3 Rm 206 @301). Unless he changes his schedule, my son will have a class in Campbell Hall in the fall: Linear Algebra. His other classes will be tiny, all being College of Creative Studies computer science classes for freshmen, so having 10–20 students. I’ve been suggesting to him that he delay linear algebra by a quarter or two, so that he can take the CCS physics series with the CCS physics majors. It isn’t clear that they’ll allow him to do that, but he neglected to tell his computer science adviser that he was interested, and the CCS physics adviser was not around to talk to, so he’ll have to ask about that by e-mail, if he decides to try it. The orientation was carefully designed to separate students from the parents, with the students talking with advisers and with other students, and the faculty hearing from administrators (and a few students). There were a few combined sessions for students and parents, but not many (campus tour, welcome assembly, half the College of Creative Studies meeting, an Education Abroad Program presentation). Supposedly we could eat meals together, but my son managed to make friends with a few of the other CCS students, so he had both lunches and the Monday dinner with them—I only ate with him for the Tuesday breakfast. Incidentally, the dining hall had fairly good food—better than any of the other campus dining halls we’ve eaten at—and we were told by students that this was not a special “for the parents” thing, but that the dining hall food was routinely that varied and that good. Most of the presentations had very little new content for me, as they were aimed mainly at parents who had not been to college (UCSB, like all the UCs, takes pride in what a large proportion of their students are the first in their families to attend college). I did pick up a few tidbits of useful information, like getting my son to add me to the e-mails about the bills from UCSB, so that I can transfer the funds from the Scholarshare 529 plan without the delay of waiting for him to forward the bills to me. The meeting with the CCS students and a couple of the CCS faculty was worthwhile, but sending us to the Letters and Sciences panel discussion afterwards was a waste of time—I would rather have had a chance to hear from the engineering faculty or students. The only really good presentation was the “Packing, Prepping, and Parting” presentation for parents Monday night. It was very entertaining, but made the strong assumption that all students would come by car. Since packing and prepping are even more challenging for those coming by plane, bus, or train, it would have been useful to spend a little time on that. There was a brief mention of the Amtrak station in Goleta (which serves the Pacific Surfliner only, not the Coast Starlight) and no mention that MTD bus service to the train stations is limited on weekends (the move-in days), since the 15X doesn’t run on weekends. The presentation “your student’s first year” was so generic as to be useless. I was also rather surprised to see some copyrighted cartoons copied off the web without permission (the watermarks to show that these were unlicensed were still clearly visible). UCSB is not so poor that they need to steal intellectual property from cartoonists, and it sends a very bad message to students about plagiarism and intellectual property to be so cavalier about copyright in an official university presentation. The EAP (education abroad program) was one of 7 “co-curricular workshops” that we could choose among to attend together, none of which sounded very interesting. My son fell asleep during it and I nearly did—they could have provided a lot more content in a much less boring presentation. The Tuesday afternoon was dedicated to registering for classes, but the CCS students got that done early, so we had the afternoon to wander around campus, taking our own tour of the science and engineering buildings, which had only been pointed out as being “over there” in the general campus tour. We did not go down to the beach, though that might have been a pleasant option to cool off. We rarely get to the beach in Santa Cruz either—it is not big on our list of fun things to do. On Sunday night and Tuesday night we ate in Isla Vista. We had Indian food at Naan Stop Sunday night and Vietnamese food at Pho Bistro Tuesday night. Both were adequate of their kind and clearly local rather than chains. Isla Vista has about 30 eateries, all of “college student” styles, so there are places to go if the dorm food gets too repetitive, though the variety is somewhat limited. Isla Vista does not have much else in the way of retail—students are expected to go 2 ½ miles to Kmart, Costco, Home Depot, and other shopping-center stores in Goleta for anything other than convenience store or bike store stuff. Overall, my impression of UCSB is that it will be a good place for my son to go to school. The CCS program gives him some small classes, good access to research opportunities, very flexible general-ed requirements, and an easy way to meet fellow geeks. He’ll have to put up with a few large classes (like linear algebra), but he’ll be past them fairly quickly if he makes good choices. The campus is well set up for bicycling, and it is not overly influenced by fraternity or sports culture (though both are more accessible than at UCSC). The culture is a little more “southern California” than he is used to, but I don’t know if he’ll even notice the difference, other than the greater exposure of skin, which is driven more by the climate than by the culture.